A researcher watches RoboJelly, an unmanned underwater vehicle that swims like a jellyfish and uses hydrogen from water as fuel. These are the kinds of jellyfish you don’t need to be afraid of. They look and swim like jellyfish, but they’re actually water-dwelling fuel cells attached to an artificial muscle, and they might just be the answer to a powerful and cheap way to monitor the world’s oceans. RoboJelly is the creation of associate professor Shashank Priya and his team at Virginia Tech’s College of Engineering. This biomimetic robot has a bell-shaped, rubbery skin made of shape-memory alloys that return to their original shape after being bent. The bell’s dimensions are true to that of the Aurelia aurita jellyfish, and it propels itself through the water with the same slow, pulsatile mechanics of its biological counterpart. Except it doesn’t eat small sea critters to keep it going, but draws its energy directly from seawater. The bell is comprised of eight segments which are wrapped in carbon nanotubes, and the nanotubes are in turn coated with a platinum powder. Hydrogen and oxygen from the water – presumably liberated through electrolysis – are delivered to the bell segments where the platinum powder catalyzes a chemical reaction between the two. The reaction produces heat which then causes the segment – or actuator – to bend. And RoboJelly swims. According to the researchers, theirs is the first underwater robot to be powered by an external hydrogen source. A study on RoboJelly was published this past March in the journal Smart Materials and Structures. 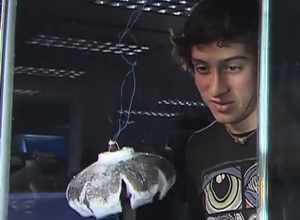 Take a look at the robot’s very jellyfish-like swim in the following video. Virginia Tech: RoboJelly from virginiatech on Vimeo. Four years into development, RoboJelly still has a way to go. The robot in the video isn’t actually using running on hydrogen, it is electrically powered. So far the hydrogen-powered version has only been tested while it was fixed to the bottom of the tank. In addition, the team is working to develop other RoboJellys across a range of sizes, from about the size of a hand to more than five-feet across. The ultimate goal of biomimetics – replicating biological systems with artificial materials – is not to merely “replicate,” but to be guided by and ultimately improve upon nature. In Priya’s case, his goal was to build a better jellyfish. The unlimited fuel source means RoboJelly could theoretically travel the world’s oceans until it breaks down, beaming back data all along the way, from the range of an oil spill to precision current mapping. But we shouldn’t assume RoboJelly is being developed purely for the good of science. It is in fact a product of a $5 million grant from the US Navy’s Undersea Warfare Center and the Office of Naval Research. And Virginia Tech is developing RoboJelly’s propulsion system, other universities are fitting it with an array of sensors. But why a jellyfish? Why not just attach a propeller to a Sensorbot? Because something that looks like native sea life stands a much better chance of swimming under the radar. And with an inexhaustible energy supply, a fleet of RoboJellys could provide round-the-clock surveillance in the precarious waterways of the world. Still, a victory for biomimetics, if not for conservation, but for camouflage.